Going into the theater to see Don’t Breathe I hoped that the trailer had not given up too much information, as they often do. More times than my movie-going pocketbook likes to find out, I’ll be watching a movie only to realize that the best scenes were in the trailer… and there are no surprises from my characters. 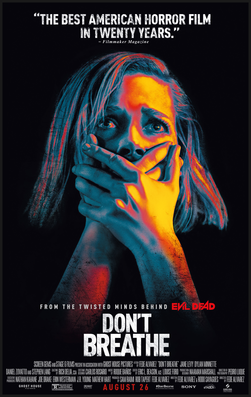 This (despite the fact that I think the trailer DID share a little too much) thankfully was not the case with Fede Alvarez’s Don’t Breathe. There was still enough movie left to leave the audience breathless by the end. What the trailer did do, however, is preset my brain for tension — so much so that, as soon as the movie started, I felt my hands grip the seat and my teeth grind together in anticipation of what was going to happen to our stupid protagonists. Home invasion movies have been done to death (pun intended) and are not usually favorites of mine. But ‘Don’t Breathe’ absolutely gave us a new twist on this type of genre film. 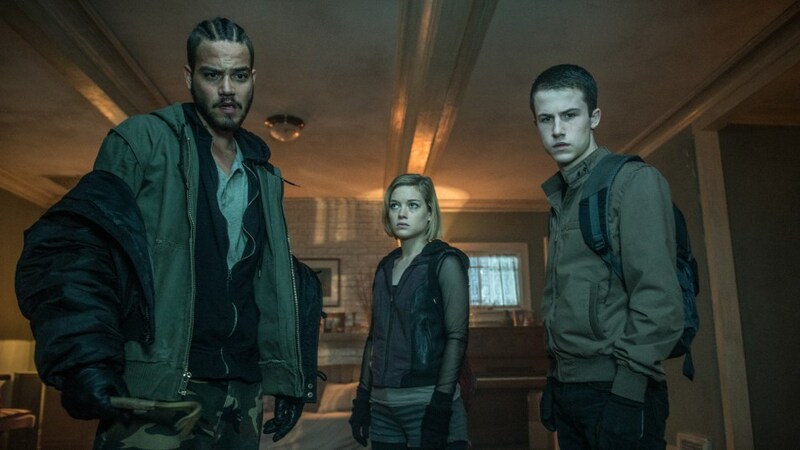 In Don’t Breathe, we find Alex (Dylan Minnette), along with his friends Rocky (Jane Levy) and Money (Daniel Zovatto), robbing houses in the wealthy areas of Detroit. Since Alex’s father owns a security company, their job is a little easier… they rob houses using his pass keys and alarm remotes. But the scores aren’t big enough, and Money comes up with a great idea to rob a blind veteran who came into a ton of cash from a settlement after his daughter was killed in a car accident. He lives in the only house left in a deteriorating neighborhood. And, since he’s blind and lives all alone, the friends assume robbing him will be a snap. This heist would set them free to move on with their lives and relocate to California. It doesn’t take long for our three young burglars to realize they have made a huge mistake underestimating The Blind Man (played magnificently by Stephan Lang) they decided to rob. As an audience member, you are quickly given something to think about. Who are really the bad guys? Typically, when someone breaks into a home we consider them to be criminals. However, right off the bat we’re made to feel sympathy for our female thief Rocky, as we are shown a glimpse of her abusive home life she’s so desperate to escape. We care about her because of the little sister she loves and wants to protect. Thus, the audience is left hoping that the young burglars survive, escaping both The Blind Man and their dead-end lives in Detroit. We also feel for the third wheel of the group, Alex, who is obviously in love with Rocky. He can’t have her because she is dating our least favorite character, Money. So, presented with a dilemma as the ones looking in, should we feel sorry for the burglars or the man being robbed? That dilemma resolves itself eventually when we find out the disturbing truth of what The Blind Man is really about (No spoilers… all I can say is WOW! ), and we watch in tense fascination as one terrible thing after another befalls the burglars. This was a very physical movie for actress Jane Levy. Kudos to her! 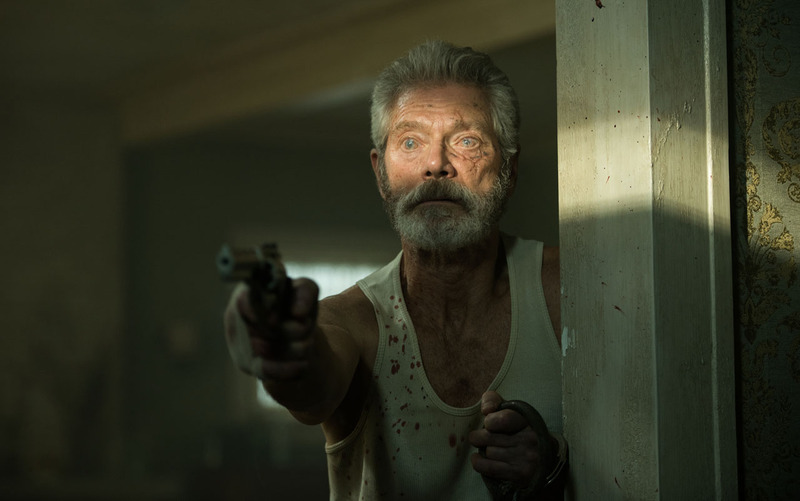 Don’t Breathe is not about dialogue. In fact, there is very little talking in it. But the scary, breathy sounds coming out of actor Stephan Lang — along with his reactions — said volumes, without the use of full sentences. What made the movie work was the anticipation of the brutal attacks; the threat of violence from the cat and mouse game. We feel the fear in a palpable kind of way. There was some blood and gore, but The Blind Man and his house become the center of the movie. Our burglars panic and become the victims and the hunted. He has them trapped, and he knows his way around the dark; they don’t. The cinematography by Pedro Luque was so clever and creepy. The audience feels trapped in the labyrinth-like basement and house, as much as Rocky and Alex are. Whenever The Blind Man shows up right behind them, people were jumping in their seats. There were also some very Cujo moments with the blind guy’s not-so-friendly dog, that they thought they had taken care of by slipping him some sleeping pills. The tension in this movie builds and builds, right up to the end and never lets up, keeping us all barely breathing in our seats. It was an amazing roller coaster of terror, and I think all horror thriller fans will love it!